The story of the how the newly formed Green Student Movement was able shake Denmark closer towards fighting climate change, within less than a year. 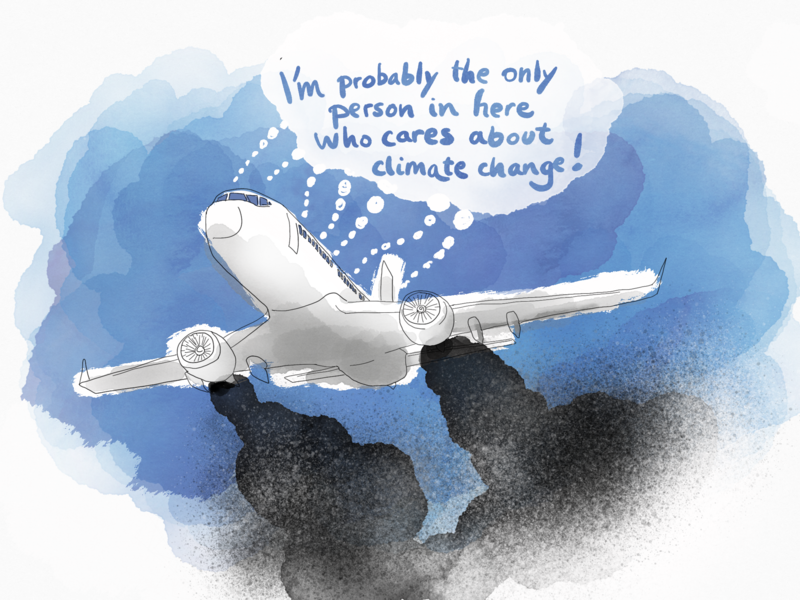 A little more than a year ago, I finished a dissertation that tried to explain why we do not seem to change our carbon-intensive behavior, despite knowing so much about the urgency of climate change and the role we humans play in bringing it about. This question had puzzled me ever since I learned about climate change in 7th grade. Being enormously saddened and scared by the troubling information I suddenly possessed, I asked adults around me what we should do to prevent this terrifying disaster from happening. The message was that we should all do as much as possible to limit our energy consumption by e.g. switching off the lights when leaving a room, unplucking our phone charger when not in use, showering for less than 10 minutes, avoiding driving, avoiding flying, etc. Being highly motivated to reduce my own as well as my family’s carbon footprint, I soon started demanding that we all followed these many steps. However, to my big disappointment, no one, not even the most knowledgeable around me, seemed keen on following the advice. I was very frustrated by this lack of action and assumed the reason was that no one else than me really cared about climate change. However, despite trying my very best, I was also struggling to live up to these requirements – especially in social contexts. This was mainly due to a fear of being labelled as a self-righteous environmentalist and a lack of motivation for entering tiring discussions about the scientific basis for claiming that climate change is human-made. Fast-forward to my dissertation, after having read a ton of social psychology, I realized that many of our actions are guided by our desire to belong to a social group. This desire is so strong that it can even lead us to act in ways that conflict with our private beliefs. I also found some studies that had detected a widespread tendency to underestimate the climate worries of others, despite the ‘worried ones’ making up the vast majority in most countries. Having myself assumed that no one really cared about climate change, I was very surprised when I later read a public opinion study showing that no less than 88 percent of Danes – including 96 percent(!) of Danish youth – believed climate change was a serious problem. A theory started to form in my head that maybe most of us, myself included, were inhibited from taking climate action, not because we did not know enough about it, or because we did not care, but because we were afraid of deviating too much from the groups we identified with. And, maybe this fear was based on a mistaken belief that most of our friends, family members, and acquaintances did not care about climate change and would think negatively of us if we started to engage widely with these issues. I concluded that to stimulate climate action, we needed to make our climate worries visible. In April 2018, I was lucky to be given the opportunity to share these insights in a Danish radio show called Klimatestamentet. Shortly after the episode aired, I was contacted by several people who shared their excitement about learning that there existed students out there who were engaged with climate change. Soon, I met up with a small group of students who had already started their own climate initiative and a group of academics who were trying to mobilize researchers from all over Scandinavia to collaborate on speeding up the green transition. We all agreed that engaging the wider student body was paramount to bringing about the large-scale societal transitions needed for a more climate-friendly future. In May, we organized a meeting for students of all disciplines and institutions who would be interested in creating and becoming part of a new inter-disciplinary climate-focused student movement. Not knowing what to expect, we were pleased to see that around 40 students showed up. Among these were representatives from already existing smaller student-led climate initiatives. After some introductory talks, the large group was split into smaller ones. In every group, we presented ourselves and shared what worried us most about climate change. For many of us, this was the first time we shared these feelings with anyone. It was an almost therapeutic experience for me to be in this room together with other young people I had only just met who openly admitted to being as terrified and frustrated about climate change as I was. We realized that our climate worries made us part of a community that had been invisible until that day. We also realized that we could accumulate all the frustration and anger each of us had carried in solitude and turn it into something productive, namely meaningful collective climate action. These realizations created an uplifting feeling of hope and excitement for the future, a feeling many of us had not felt in years. We then discussed how we as a student movement could ensure that climate change would become the most talked-about issue in politics and among those governing our educational institutions. The most interesting ideas gave rise to task forces consisting of whoever thought they could contribute with something. We of course also devoted a task force to finding a good name for our movement. We agreed to meet every other Monday to update each other on how the work was going in the smaller groups. Demanding that our educational institutions prioritize climate change in all major decisions regarding facilities, curriculum and the research conducted. Our first event was the Green One-Day Festival which took place in September 2018 after an unusually dry and hot summer. We organized the festival with the intention of creating a positive vibe around our movement and to mobilize students to the many upcoming activities we had in mind for the fall. The event started out with researchers giving talks about the steps needed for a sustainable energy transition, about how social movements have brought about political change historically, and about the importance of shifting focus away from individual consumer responsibility and onto finding ways to stimulate effective large-scale policy changes. After these talks, we had organized some workshops. One consisted of painting banners for upcoming protests. We also wrote letters to those politicians responsible for formulating climate-relevant policies – an activity that has now turned into a recurring event. A third workshop concerned ensuring a healthy social environment in a movement based on voluntary forces. Another dealt with finding ways to effectively putting pressure on our educational. After a couple of hours’ important work, there was a cheap climate-friendly meal for everyone to consume before dancing the night away to the three live-bands we had hired. We had also invited a journalist from a large Danish newspaper to report from the day. To our pleasant surprise, the report was published the following week on the front page of the newspaper’s debate section. This was the first time we went public as a movement in the media and it was also an indicator of how well the media would generally receive us. When we are interviewed, we often share our personal worries and anxieties related to climate change. Our intention is of course to make climate worries visible among the young generation. This personalized angle has turned out to be an effective communication tool, as it both evokes an element of conflict, which journalists tend to like, but at the same time avoids reinforcing harmful ideological divides. By focusing on sharing our own stories, we bring a fresh voice into the conversation which makes people want to listen to us. Furthermore, as a movement, we do not see our role as providers of facts about the state of the climate, as we believe others are better suited for that and as we do not think more climate facts are what is needed right now to bring about structural change. Rather, mobilizing people is crucial for creating a political awakening. The first political activity we organized was to sit in front of the parliament building for two days in a row to ensure that politicians would take climate change into considerations when formulating policies. This turned into a tradition called the ‘weekly climate reminder’, where every Thursday morning, we stand in front of the parliamentary building together with various other climate initiatives and concerned citizens alike. Other activities have since followed. In November, we organized a debate with representatives from our educational institutions on how to ensure that the research conducted supports the fight against climate change. The same month, we also helped organizing national school strikes together with Fridays for Future. Furthermore, our recurring letter campaign has enjoyed considerable attention with some of the letters having even been published in full length in an online news media. It has increasingly become clear to me that the advice I got as a child that the best way of tackling climate change is by changed consumption habits, is really problematic. It easily makes us forget that we can work collectively to demand that those who have the power to change things on a large scale start taking action. Moreover, there is a lack of transparency about which consumer choices are in fact climate friendly, which makes living climate-friendly rather cognitively demanding – especially in a carbon-intensive industrial society as the Danish one. So, although I myself have chosen to eat plant-based and avoiding planes because my personality is such that I like going ‘all the way’, I have become aware that I cannot expect everyone else to do the same. The work I have put into this movement will forever be more impactful in terms of tackling climate change than any personal consumption change I could ever make – no matter how radical and significant the change may seem. However, I will continue living like this, as it keeps my mind focused. Also, every time I run into an obstacle, I become aware of precisely what structural changes are needed to make it easier for everyone to live more climate-friendly. In addition to obtaining a solid media presence as the ‘voice of the young generation’, in December a public opinion study was published showing that climate change was now for the first time on the very top of Danish voters’ agendas. It had jumped no less than five spots since last year’s survey! A political commentator called the result ‘remarkable’ and an outright ‘breakthrough’ for the green agenda. Also in December, the Minister of Climate proclaimed he would set up a youth climate council to include the ideas of young people, who “are not as resistant to alternative climate solutions as the older generations and who are more inclined to give priority to climate rather than the continuation of bad, old habits”. Moreover, we are constantly being invited to participate in debates and climate-related events and festivals. On reflection, it now seems absurd that one year ago people were surprised to hear a young person like me talk about climate change on the radio – especially after witnessing Greta Thunberg’s impressive school strike for the climate. I hope this article can serve as inspiration for everyone who goes to bed at night with climate anxiety in their bodies and who would like to turn this energy into something productive and meaningful for themselves and the world. I am currently studying an MSc in Philosophy and Public Policy at the London School of Economics and Political Science. I finished my BA in Philosophy at the University of Copenhagen in June 2018. While studying in Copenhagen, I worked as a student assistant at the interdisciplinary Center for Information and Bubble Studies located at the University of Copenhagen. The research center, led by Prof. Vincent F. Hendricks, is specialized in formalizing and investigating how various social psychological phenomena can lead to harmful outcomes online and offline. Prof. Hendricks supervised me on my dissertation and was the one who gave me the brilliant idea to study the impact of social norms on our climate behavior. A revised version of my dissertation, co-authored by Prof. Hendricks, was published in November 2018 (see recommended reading below).